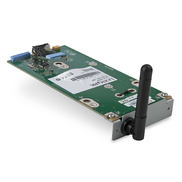 The MarkNet N8250 internal print server provides 802.11b/g/n wireless printing capabilities to Lexmark printers using one RP-SMA connector with antenna. Using the 2.4Ghz band, this wireless print server connects to any wireless network to provide full network printing capabilities. Offering a connection speed of up to 72Mbps (1x1 SISO 802.11b/g/n) and with 802.1x authentication and IPSec, the MarkNet N8250 can even operate in a secure environment. An internal print server to connect to most major wireless networks via the 2.4Ghz band using one RP-SMA connector with antenna.